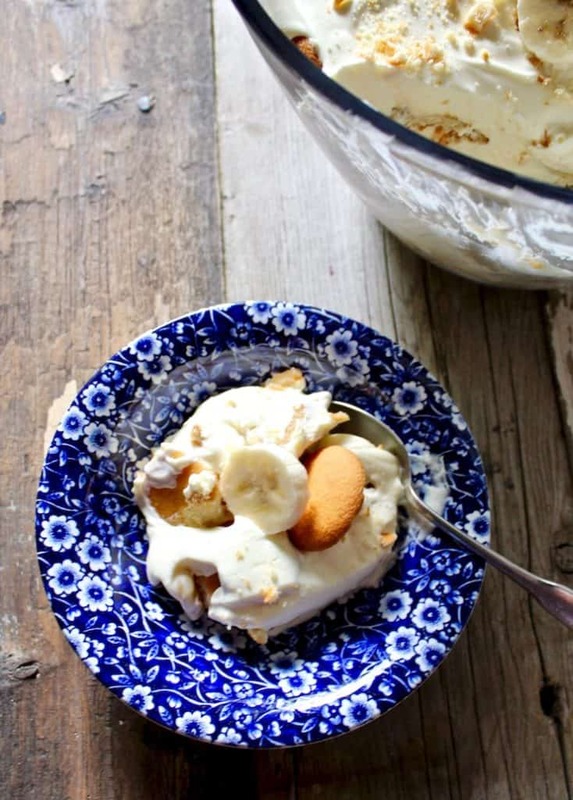 Magnolia Bakery’s banana pudding ~ the iconic NYC bakery’s famous banana pudding is creamy, dreamy, fluffy and so easy to make at home with simple ingredients! I have three daughters, two of which attended college in New York City. I’m pretty sure the first thing they both discovered was Magnolia Bakery. At the time, the draw was their cupcakes. But on one visit, while waiting in line, they were handing out free samples of banana pudding. My middle daughter was hooked ever since. I remember those banana pudding samples, and I remember thinking it was really good. I also thought it must be some highly complicated, highly guarded secret recipe. It’s neither complicated nor top secret and the recipe can easily be found on the web or in The Magnolia Bakery Cookbook. And wait until you see the ingredients, they are practically staple pantry items. 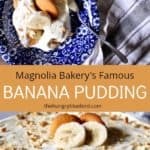 What’s in Magnolia Bakery’s banana pudding? Are you ready? Vanilla pudding (from a box! ), sweetened condensed milk, heavy cream, Nilla wafers and bananas. Surprised? I was but I was relieved to see I could make this at home so easily and it would taste like I got it from the bakery itself. And my daughters were pretty happy with this discovery. 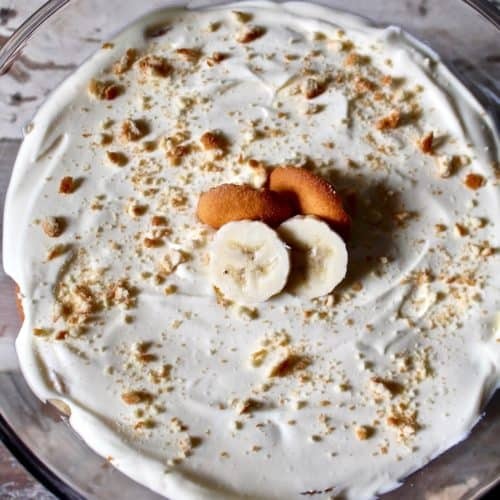 Just make the pudding mixture and then layer it with the Nilla wafers and bananas and chill. Voilà! I made the pudding in a trifle dish for you guys, but any container works, including the 9″ by 13″ glass dish I usually use. My girls make this all the time and have even used Tupperware to assemble and serve it in! At least it’s portable that way, and they usually make the banana pudding and take somewhere. 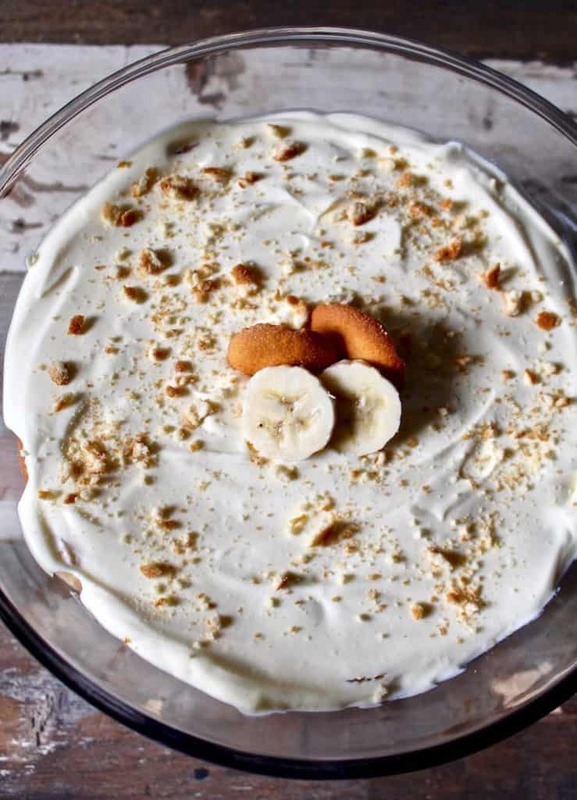 If you try this recipe for Magnolia Bakery’s Banana Pudding or any other recipe on the blog, then don’t forget to rate the recipe and let me know how yours turned out in the comments below ~ I love hearing from you! You can also FOLLOW ME on FACEBOOK, TWITTER, INSTAGRAM and PINTEREST to see more of what I’m cooking in my kitchen and recipes. Never miss a post ~ sign up for The Hungry Bluebird Newsletter for a weekly email of new content. Another creamy, luscious dessert you might also like is my no-bake Eclair Cake, also one of my family’s favorites. 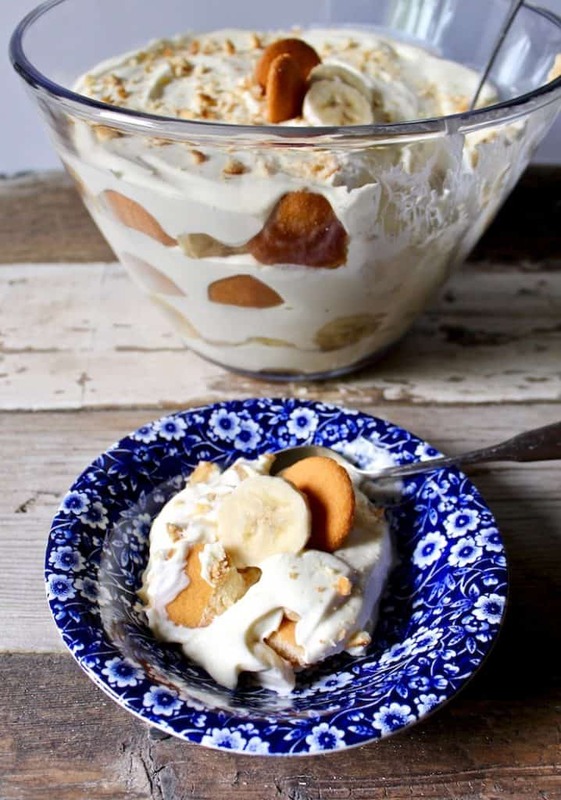 Magnolia Bakery's famous banana pudding recipe, layers of creamy pudding, Nilla wafers and bananas. So easy to make at home. In bowl of stand mixer or mixing bowl with electric mixture, combine sweetened condensed milk and cold water, then add pudding mix and beat/blend for 2 minutes. Transfer to bowl, cover and refrigerate for at least 4 hours. Beat heavy cream in bowl of stand mixer until fluffy and medium-stiff peaks form. Fold whipped cream into chilled pudding mixture and fold and stir until just combined and there are no streaks. 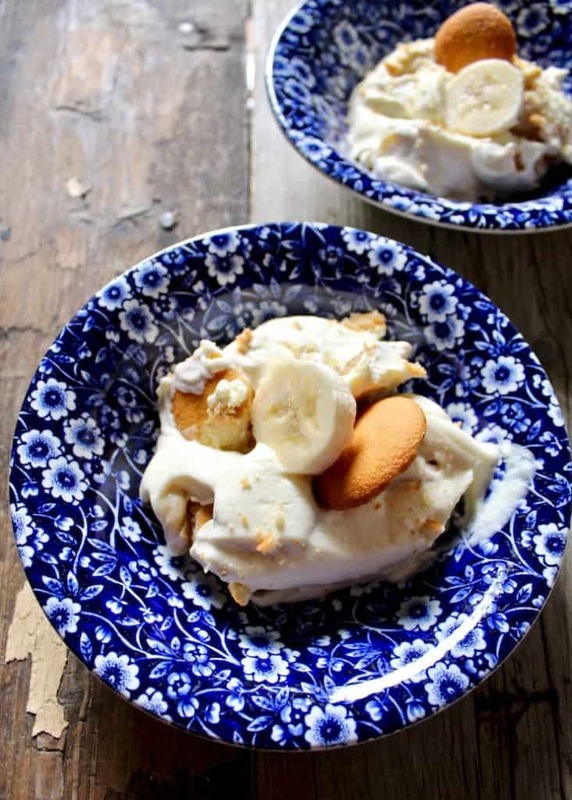 Assemble banana pudding. Peel and slice bananas. 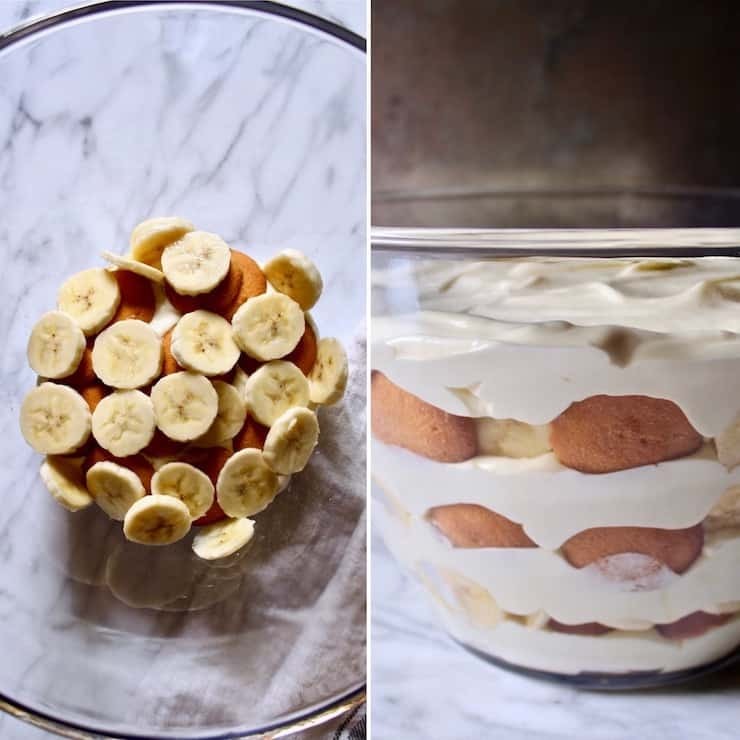 In a trifle dish, or any large dish or pan, add a layer of pudding, a layer of wafers, and then a layer of banana slices. Repeat with two more layers, ending with the pudding mixture on top. Amount of layers depends on size of dish. Cover and chill for 6 hours to overnight. 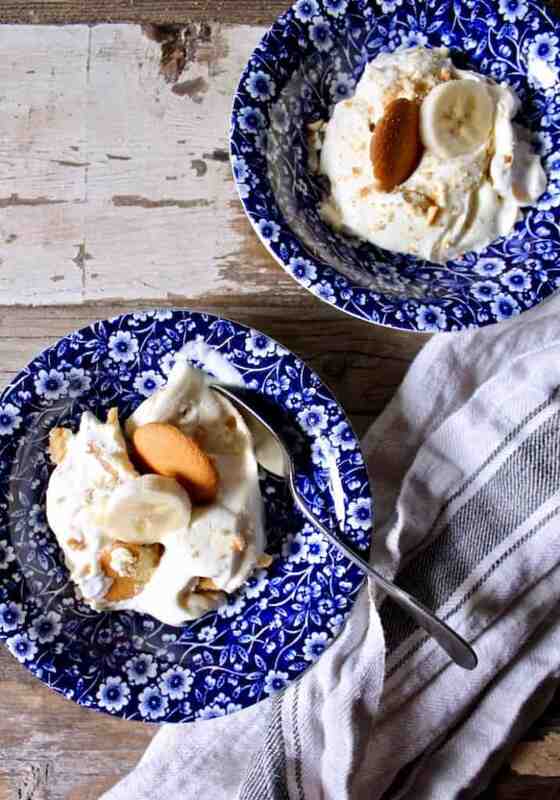 Garnish with crushed wafers and banana slices, if desired. Heavy cream, sometimes called whipping cream, 3 cups (24 oz.) of that, not 3 cups of already whipped cream. Can I use dr. Oetker vanilla pudding mix(that usually is cooked)?